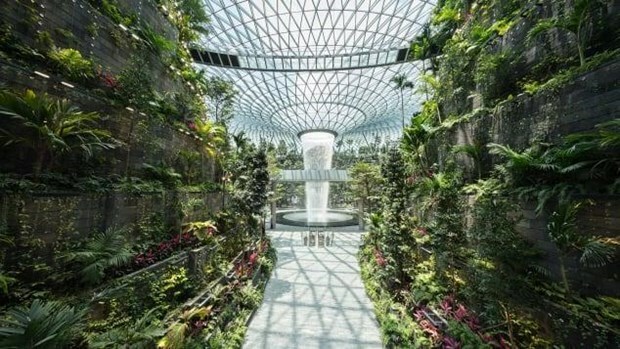 Singapore (VNA) – Singapore officially put into operation the country’s largest-ever entertainment complex at Changi international airport on April 17. Build on 135,700 sq.m at a cost of 1.7 billion SGD (1.25 billion USD), the four-storey Jewel complex has gardens, 280 retail and food outlets, a hotel and cinema. It links to three terminals of the airport. The highlight of the complex is a 40-metre indoor waterfall cascading through a steel and glass dome. According to the airport’s representative, a total of 26 airlines including Singapore Airlines - representing 60 percent of departing flights at Changi – will offer early check-in at Jewel. Apart from attracting more passengers to the airport, the complex serves as a destination for Singaporeans to shop and dine, and enjoy entertainment services. Jewel is a joint venture between Changi Airport Group (CAG) and CapitaLand. The project, first announced by Prime Minister Lee Hsien Loong in his National Day Rally speech in 2013, aims to secure Singapore’s position as a premier air hub.